He may have been vain and lacked any sense of humour, but William Shakespeare's Malvolio got one thing right: some people are born great, some achieve greatness, and some have greatness thrust upon. Judging by his exploits at the 73rd Vuelta a España, Enric Mas falls into the second category, his brilliant runner-up spot in the general classification speaking volumes of the potential and determination the 23-year-old Mallorcan – one of the youngest riders to podium at a Grand Tour this century – possesses. The season's final Grand Tour represented Enric's first foray into riding for the GC at a three-week race, and after a rather quiet first half of the race, in which he had to overcome illness and fever, Quick-Step Floors' prodigy began a rapid and spirited rise in the standings, which catapulted him from twelfth to second in the space of a week during which the peloton traveled through Cantabria, the Basque Country and Andorra, taking on some of the Iberian Peninsula's most grueling climbs. Riding beyond his years and taking initiative in the final days of the race netted Enric not just the most important win of his career on the hardest mountain stage of his home Grand Tour, but also an outstanding second place in the general classification, which served as confirmation of the talent that had brought him into Quick-Step Floors' attention years ago, when he began his rise through the rankings. "Second and best young rider it's something I wouldn't have dreamed of at the start of the race, but arriving in Madrid having achieved this makes me extremely happy. From here, I will fly to Innsbruck for the World Championships, where I want to help Spain get a good result, before my last races of the season with Quick-Step Floors", said Enric, who was beaming with happiness after becoming the first Spaniard in three years to podium at La Vuelta. The final day was a ceremonial one in the first part, that is until the peloton hit the streets of Madrid, where Quick-Step Floors shut down the two separate breakaways which emerged inside the final 40 kilometers, before bringing Elia Viviani to the front. 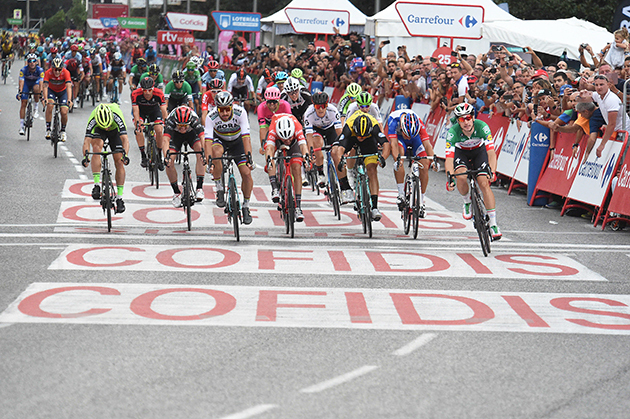 Despite losing the wheel of his teammates in the hectic final that ensued, the Italian Champion bounced back in the closing meters and found a space on the left side of the road, powering down the barriers and claiming his 18th victory of the season and Quick-Step Floors' 67th. "It was the last day of a really tough Vuelta and I came into this stage having lost a lot of power compared to the first part of the race, but still was super motivated. I lost my lead-out with two kilometers to go in a roundabout, but I remained confident and on the last corner I informed my guys to not go full gas, so they stopped. 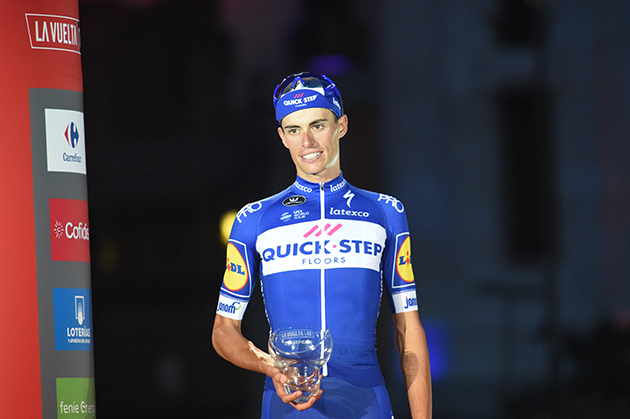 I came strong from the back in the finale, found a gap and surged to victory here in Madrid, which was one of my goal since we embarked on this journey in Malaga", an ecstatic Elia said after netting the 88th Grand Tour stage win in the history of Quick-Step Floors. Viviani, who became just the fourth rider this century to win at least seven Grand Tour stages during a season, continued: "We can be really proud with what we have achieved as a team. It's been an tremendous season, which I end here with this great win, and I want to thank Quick-Step Floors for the way they supported and helped me since joining the team." Quick-Step Floors' brilliant run in the last Grand Tour of 2018 helped the squad managed by Patrick Lefevere get one step closer to wrapping up the World Tour team classification, which our outfit leads since the month of March and where, with just a handful of races left until the end of the season, enjoys an advantage of more than 3000 points over the nearest opponent. "We did great in this season's Grand Tours, winning multiple stages and three secondary classifications. To be frank, it's been a dream and I hope it will never end. I am proud of the entire team and very happy with Elia's three victories and Enric's beautiful runner-up spot and win atop La Gallina", Patrick Lefevere commented in Madrid. "He came here with top 10 aspirations, but what he has shown throughout this race is really phenomenal and I'm sure he will continue to progress as long as he works hard and remains with his feet on the ground. As for the entire team, it's been a vintage season and it shows no signs of abating, which gives me huge pleasure and satisfaction." 26-year-old Simon Yates has rolled across the line in Madrid to claim his maiden Grand Tour at the La Vuelta a Espana, creating history in the process as the first Grand Tour victory for an Australian-owned team, Mitchelton-SCOTT. After winning three stages and wearing the Maglia Rosa for 13 days at the Giro d’Italia, Yates once again won a stage and led the Spanish Grand Tour for ten-days, but this time a more conservative strategy saw him take the jersey all the way to the final day in Madrid. With the lessons of the Giro d’Italia fresh in the mind, Mitchelton-SCOTT set off from the Malaga in the south of Spain three weeks ago with a conservative strategy for its eight-rider team. Albeit frustrating at times, Yates and the Australian team played their cards to perfection whilst keeping an element of their trademark flair. An ‘accidental’ attack on stage four was a glimpse of Yates’ form before he moved into the race lead on stage nine. Relinquishing the jersey three days later to ease the pressure, it was back on the Briton’s back with an impressive stage 14 victory. Holding it into the final weekend of racing, Yates defending in the only way he knows, attacking on the final two mountain stages to secure the victory. The 2018 Vuelta a Espana marks the first ever Grand Tour victory for Mitchelton-SCOTT and an Australian-owned team. Formed in 2012 as GreenEDGE Cycling, the outfit conquered week-long races and four of cycling’s five Monuments before taking an ambitious general classification focus in recent years in pursuit of a Grand Tour victory. In 2014, the team signed three young climbing potentials in Yates, twin Adam Yates and Colombian Esteban Chaves with the ambition of building from the ground up. After a second place at the Giro d’Italia, third at the Vuelta a Espana and fourth at the Tour de France in 2016, plus four other top-10 Grand Tour results since the project began, the 2018 Vuelta a Espana has provided the breakthrough with young talent promising more to come. With some big races, including the world championships, to come, 2018 has already been a significant breakthrough for Yates. The Briton won a stage at Paris-Nice and Volta Cyclista a Catalunya in preparation for the Giro d’Italia where he won three stages during a 13-day stint in the Maglia Rosa. Returning to racing at the Tour of Poland ahead of the Vuelta a Espana, the 26-year-old again claimed a stage victory, riding himself into second overall to match his performance at Paris-Nice earlier in the season. 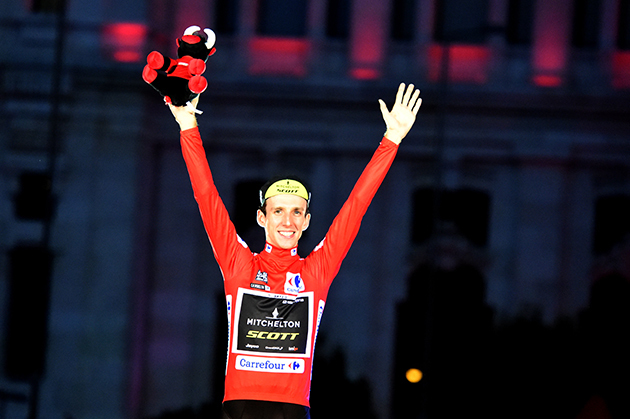 His stage 14 win and overall victory gives Yates eight wins this year and a total of 23 days in a Grand Tour lead. The jersey winners and the whole Mitchelton-SCOTT outfit toasted a successful Vuelta a Espana on approach to the finishing circuit in Madrid before the race in earnest began. Despite multiple attempts no one managed to get too much distance on the peloton, and an expected bunch sprint resulted with Elia Viviani (Quickstep Floors) the victor and Matteo Trentin finishing eighth for Mitchelton-SCOTT. “It feels great. Really unbelievable, I think it’s still sinking in. I have no words, it’s just really unbelievable. I like to race on my instinct and I hope that I continue to do so and achieve more big results like today at the Vuelta a Espana." “I feel like I’ve come in at the right time more than anything and that I’ve been able to bring in a little of what I’m about to this whole group. I was looking through our objectives at the start of the race and they were that we needed to be precise and calculated. “Looking back at yesterday’s stage and we were exactly that. Simon was the best of everybody on every stage apart from yesterday and he wasn’t quite as good as everyone else, but that means he got it exactly right because he was still there or thereabouts. “We did good and one of the best things was that the boys yesterday, some of them were out of their normal terrain, but they weren’t scared, they were there and committed when they needed to be. They were great. “To be here in 2018, winning our first Grand Tour is unbelievable, but also believable because we just did it. The last few years we’ve evolved as a GC team and I am sure that this is the first of many to come, it is very hard to do, but we will try. After more than 3,000km of racing and stage after stage of excruciatingly painful climbs, the 2018 Vuelta a España came to an end on a flat finale in Spain’s capital city. The last day of a race that brought excitement on every stage finished in Madrid with a frenetic and fast-paced bunch sprint. 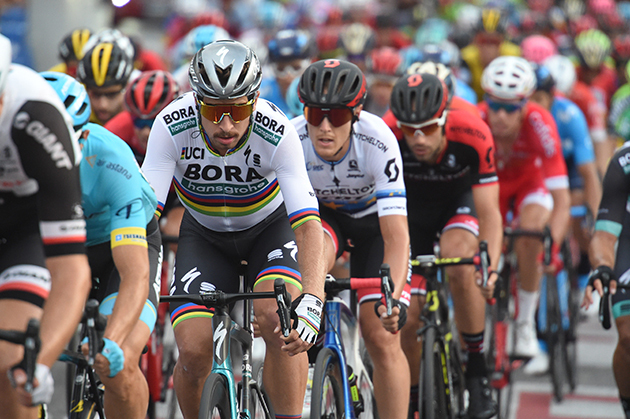 Speeds exceeded 70km/h as the sprint teams set the pace, BORA-hansgrohe riding hard on the front to bring the UCI World Champion, Peter Sagan, into position. While both the team and Peter did everything right, the Slovak rider was just beaten to the line. Peter Sagan wasn't able to beat Viviani today. Sirotti photo. Totally flat from start to finish, this final stage into Madrid was more a procession than an outright road stage. Riders would have the opportunity over the 100.9km parcours to spin their legs and wind down after a relentlessly difficult three weeks of racing. Entering Spain’s capital city for the end of the race, the final part of the stage would see riders take on a circuit ridden ten times before the sprinters would challenge for the final victory of the 2018 edition. This circuit would make it difficult for any breakaways to stick, as well as the fast pace from the peloton making it even harder for any small groups to stay out in front. It was all but guaranteed that today the Vuelta would be brought to a close with a bunch sprint. If a stage is marked as one for the sprinters, you can be sure that the UCI World Champion, Peter Sagan, will be up there in the finale. The sprint on a final stage is always more complicated than other flat finales, given that riders are tired after three weeks of racing, not to mention the fact that the speeds in the run-up to the finish are even faster and the racing more hectic, as riders push hard to give the crowds a thrilling finish. With this in mind, the team would be working flat out to make sure the Slovak rider was delivered to the line safely for a last bid to take the glory in front of the Spanish fans. As the race’s final stage, it was a much more relaxed affair from the start today, with the climbers and GC riders taking things easy after their race essentially ended yesterday, and the sprinters saving their energy for the end of the day. The fact there was no breakaway to control in the early stages of the day made the going much more straightforward. The pace picked up when the riders hit the first lap of the finishing circuit, and a small break went off the front. While these six riders were only able to build a 15-second gap before they were brought in, this was setting the tone for a fast-paced and attacking finale. Another break went, but with four BORA-hansgrohe riders on the front of the peloton, with Peter Sagan close behind, it was clear it wouldn’t be long until they were reeled in too. With 10km of the day remaining, the trio of escapees was still off the front, but the bunch was hovering and simply biding their time as the number of laps to go dropped one by one, and with 7km to go, it was all back together. On the final lap, the rider in the rainbow stripes was tucked in behind the teal, black and white jerseys of his BORA-hansgrohe teammates. Peter timed his kick perfectly and was well-positioned to use the slipstreams of his rivals in the sprint, but he was just beaten to the win on the Paseo de la Castellana, taking second on the line. Finishing with the sprinters, Emanuel Buchmann closed off his race taking twelfth in the overall standings. The past three weeks, the Lotto Soudal riders animated the Vuelta as they were part of the break of the day in several stages. The attractive and combative way of racing was rewarded with a stage win by Jelle Wallays and a first place in the KOM classification by Thomas De Gendt. Yesterday, De Gendt secured his polka dot jersey and became one of the eight Belgian cyclists who’ve ever won the jersey in a Grand Tour. Thomas De Gendt and sports director Mario Aerts look back with satisfaction on the past three weeks and the performances set by the entire Lotto Soudal team. Thomas de Gendt racing in stage five.